The Shinil Group says it hopes to hoist the ship from its depth of more than 0.25 miles within months — but not everyone's convinced there's a treasure. 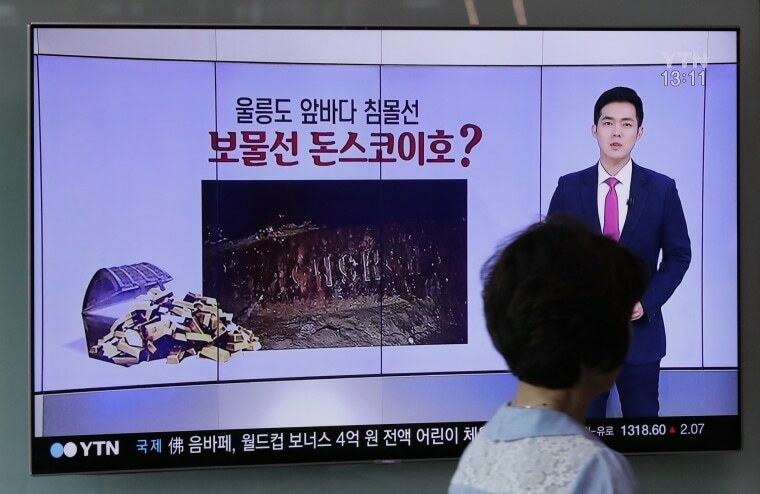 SEOUL, South Korea — A South Korean company's claim to have found a sunken Russian warship has triggered investor frenzy amid speculation the ship was carrying an enormous amount of gold when it sank 113 years ago. South Korea's financial regulator subsequently issued a warning against possible investment losses. The Seoul-based Shinil Group said Tuesday its divers discovered a wreck it identified as the 6,200-ton Dmitrii Donskoi, which went down during the 1904-1905 Russo-Japanese war off an eastern Korean island. The company speculated about 200 tons of gold bars and coins that are worth $132 billion would still likely be aboard the ship. Shinil released photos and videos taken by search submarines, which showed markings on the stern the company said was the ship's name in Russian. It said it hoped to hoist the ship from its depth of more than 0.25 miles within months. Other companies have made similar claims, but none has taken actual steps toward raising the wreck. One of them, Dong-Ah Construction, was accused of spreading false rumors to bump up its stock prices and later went bankrupt. Shinil was founded on June 1 reportedly with about $87,800. The company is unlisted but its president recently agreed to acquire shares in a local company, Jeil Steel. After Shinil's announcement on the Russian ship, Jeil's stock prices rose by 30 percent on South Korea's KOSDAQ market on Tuesday. They continued their steep rise on Wednesday morning before Jeil in a regulatory filing clarified that Shinil's president would be its second-largest shareholder, not the largest, if the deal goes through. Jeil also said it has "no relation to the treasure ship business." Jeil's stock prices dropped more than 20 percent after Thursday's trading. South Korea's Financial Supervisory Service said Thursday that it's closely monitoring trade activity involving the shares of Jeil Steel. An agency official said that the regulator was watching out for possible deceptive practices involving the trade of Jeil shares, including inducing investors through false information. "Investors should beware because it's uncertain whether the ship is salvageable and whether Shinil would be able to gain ownership of the assets even if it gets permission to raise it," said the official, who didn't want to be identified citing office rules. "Dong-Ah Construction made similar claims over the same ship but failed to deliver on its promises and went bankrupt, causing huge losses for investors." Russian scholars have said in the past that Russia was unlikely to put so much gold on a single ship and that it must have been much safer to move it by train. They also have said some gold coins could have been aboard the ship to pay the salaries of Russian navy officers. It's unclear whether Shinil would receive South Korean government approval of its salvage plans. Local laws aimed at preserving national territory and property require the company to deposit 10 percent of the estimated value of the shipwreck before starting its salvage works. An official at the Pohang Regional Office of Oceans and Fisheries, which has authority on Shinil's case, said it hasn't formally discussed the company's claim because Shinil has yet to submit a request to seek a salvage right. The official, who spoke anonymously because he wasn't authorized to speak media on the issue, said Shinil must deposit $13.2 billion, based on the company officials speculation how much gold is likely aboard the ship. Shinil disagreed on the amount of its possible deposit, saying what it has officially located was the shipwreck, not treasures on it. It estimated the shipwreck's value at $1 million and planned to put down $105,540 as a deposit. Company spokesman Park Seong-jin said his company will file a request for the ship's salvage right later this week.